This tutorial explains how to create sample / dummy data. It is very useful to know how we can build sample data to practice R exercises. 'Sample/ Dummy data' refers to dataset containing random numeric or string values which are produced to solve some data manipulation tasks. For example, you want to learn how to apply logical conditions (IF ELSE) in R. To gain practical experience, it is important to practice it with sample datasets. The simplest method is to type data values in R editor and submit it. See the example below. The program below creates 3 variables - ID, var1 and var2. The name of data frame would be df1. Note : Since var1 is a character variable, it is entered in a single quote. seq(1, 16, by=2) - sequence of numbers from 1 to 16 increment by 2.
LETTERS[1:8] - the 8 upper-case letters of the english alphabet. 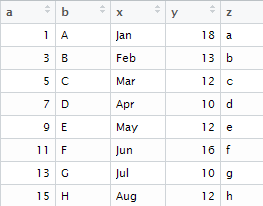 sample(10:20, 8, replace = TRUE) - 8 random numbers with replacement from 10 to 20.
letters[1:8] - the 8 lower-case letters of the english alphabet. It returns 15 random values with replacement from 1 to 3. In the code above, if sign of a random number is negative, it returns 0. Otherwise, 1. It returns random 16 characters having alphabets ranging from "A" to "E". 11 Responses to "R : Create Sample / Dummy Data"
If sign of a random number is negative, it returns 0. Otherwise, 1. Nice Work Deepanshu, your tutorial are very good short and crisp. Bhalla saab... Bas maja aa gaya. I have actually bookmarked it as one of my favorites. Could you please tell me about binary conditions that can we create it with random numbers only?